Dragon Academy developer Team Chaos has released its newest game on iOS, Dragon Trials. The game sees players taking control of one of six dragons as they compete against others in real time battle arenas. While the main goal of each game is to grab golden eggs and take them through the goal on the playing field, players can also break away from their team and simply try to defeat the other dragons. In each match, players can pick up special rainbow eggs and power-ups to increase their weapon strength, unlock temporary invincibility and more. 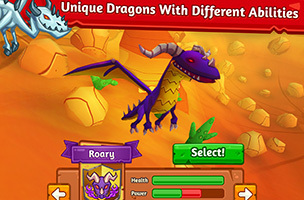 Each dragon has different health and speed stats, among others, and is controlled by tilting the iOS device. Players can tap a button to “center” the dragon on the screen, or to recalibrate things if they become off-center. Dragon Trials includes four worlds and 12 total arenas for play, as well as random matchmaking to fill games with up to four players. The game supports game controllers, Airplay, and (if players allow it) the microphone for in-game voice chat. Dragon Trials is now available to download for free on iOS, with no plans to bring the game to other platforms. Check back soon to follow Dragon Trials on AppData, our tracking service for mobile and social apps and developers.